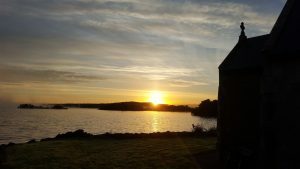 Have you had a life-changing experience in Lough Derg? DoubleBand Films wants to hear from you. The Belfast-based company plans to film unique stories for a BBC / RTÉ hour-long documentary about the pilgrimage island in Co. Donegal. 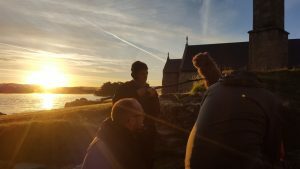 DoubleBand Films producer Órfhlaith Ní Chearnaigh told CatholicIreland.net Lough Derg was known as the “Island of Quiet Miracles” and the company wanted to talk to people who have “particularly profound experiences” of that quality. Ms Ní Chearnaigh said she wants the documentary to reach an audience that either does not know Lough Derg, or who have preconceptions of what it is. “We want to make a documentary that is about the pilgrimage and the pilgrims who go there, in their own words. We are trying not to put words into anyone’s mouth,” she said. The documentary will also look at what Lough Derg means in the 21st century. It will be in the Irish language, but not all interviewees have to be able to speak Irish as subtitles will be included. It will air next year. DoubleBand Films makes serious programming and reflective documentaries. Having recently completed a film which included the late Seamus Heaney’s poem “Station Island”, the crew became aware of Lough Derg. As part of that experience one member of the crew saw Lough Derg for the first time. “[He] saw the basilica rising up above the water and thought, ‘This is amazing’,” said Ms Ní Chearnaigh. After gaining permission from the authorities, prior and staff to film at Lough Derg, the crew went to the island for a week during August. They collected stories from those who were willing to be filmed while on their pilgrimage and from the priests and staff who facilitate the pilgrimages. “There is a young thriving generation who are going. It is lovely to see young people engaging with their faith and Lough Derg adapting to the times to a certain degree as well. So it has been eye-opening to say the least,” said Ms Ní Chearnaigh. In order to add to the accounts filmed on the island during August, the company now wants more interviews with people whose lives were deeply impacted in some way by the pilgrimage or by Station Island itself. This will allow for more in-depth discussions than could take place on the island as the company did not want to intrude on people’s pilgrimages. The filmmakers want to cast the net as wide as possible to find meaningful stories that will resonate with viewers and share some of the special qualities of the Island of Quiet Miracles. For example, one young man felt the call to become a priest while on Lough Derg and now he is in the seminary. These final interviews need to be completed in the next few weeks. So those with stories should contact the company as soon as possible. DoubleBand Films was established in 1988 by Michael Hewitt and Dermot Lavery, and has strong links to the BBC and Channel 4, RTÉ and TG4, and a wide range of international broadcasters. The documentary Hammond: Duais an Dorais aired on BBC 2 on 26th August to mark the 10th anniversary of David Hammond’s death. It examines the life and legacy of the broadcaster, folk-singer and artist. Films screened recently in the United States include the Liam Neeson-narrated, award-winning feature documentary Road (on Netflix) and Making the Monkees (on Smithsonian Channel).